24th March every year is the World Tuberculosis day designed to spread awareness about the global epidemic of tuberculosis and efforts to eliminate the disease. Today, this disease causes the deaths of about 1,6 million people each year, mostly in the third world. The reason that it is on 24th March is because the day commemorates the day in 1882 when Dr. Robert Koch announced that he had discovered the cause of tuberculosis, the TB Bacillus. By the time of the announcement in Berlin, Europe and Americas was already being raged by the TB-virus causing the death of every one out of seven people. In 1982, on the 100th anniversary of Robert Koch’s presentation, the International Union Against Tuberculosis and Lung Disease (IUATLD) proposed that March 24th would be proclaimed as an official World TB Day. 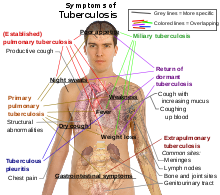 When the disease becomes active in the human body, 75% of the cases are pulmonary TB, that is, TB in the lungs. The symptoms include; chest pain, coughing up blood, and a productive, prolonged cough for more than three weeks. Systemic symptoms include fever, chills, night sweats, appetite loss, weight loss, pallor, and fatigue. Tuberculosis also has a specific odour attached to it; this has led to trained animals being used to vet samples as a method of early detection. In the other 25% of active cases, the infection moves from the lungs, causing other kinds of TB, collectively denoted extra pulmonary tuberculosis. This occurs more commonly in immunosuppressed persons and young children. Extra pulmonary infection sites include the pleura in tuberculosis pleurisy, the central nervous system in meningitis, the lymphatic system in scrofula of the neck, the genitourinary system in urogenital tuberculosis, and bones and joints in Pott’s disease of the spine. The cause of TB, Mycobacterium tuberculosis (MTB), is a small aerobic non-motile bacillus. High lipid content of this pathogen accounts for many of its unique clinical characteristics. It divides every 16 to 20 hours, an extremely slow rate compared with other bacteria, which usually divide in less than an hour. A third of the world’s population has been infected with M. tuberculosis, and new infections occur at a rate of one per second. However, not all infections with M. tuberculosis cause TB disease and many infections are asymptomatic. In 2007, an estimated 13.7 million people had active TB disease, with 9.3 million new cases and 1.8 million deaths; the annual incidence rate varied from 363 per 100,000 in Africa to 32 per 100,000 in the Americas. Tuberculosis is the world’s greatest infectious killer of women of reproductive age and the leading cause of death among people with HIV/AIDS. 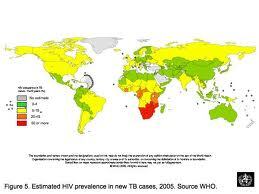 In 2007, the country with the highest estimated incidence rate of TB was Swaziland, with 1200 cases per 100,000 people. India had the largest total incidence, with an estimated 2.0 million new cases. The Philippines ranks fourth in the world for the number of cases of tuberculosis and has the highest number of cases per head in Southeast Asia. Almost two thirds of Filipinos have tuberculosis, and up to an additional five million people are infected yearly. In developed countries, tuberculosis is less common and is mainly an urban disease. In the United Kingdom, the national average was 15 per 100,000 in 2007, and the highest incidence rates in Western Europe were 30 per 100,000 in Portugal and Spain. These rates compared with 98 per 100,000 in China and 48 per 100,000 in Brazil. 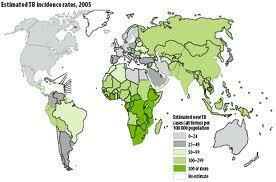 In the United States, the overall tuberculosis case rate was 4 per 100,000 persons in 2007. In Canada tuberculosis is still endemic in some rural areas. The incidence of TB varies with age. In Africa, TB primarily affects adolescents and young adults, however, in countries where TB has gone from high to low incidence, such as the United States, it is mainly a disease of elder people, or of the immunocopromised. What are the main causes of TB? There are a number of known factors that make people more susceptible to TB infection such as HIV. Co-infection with HIV is a particular problem in Sub-Saharan Africa, due to the high incidence of HIV in these countries. Smoking more than 20 cigarettes a day also increases the risk of TB by two to four times. Diabetes mellitus is also an important risk factor that is growing in importance in developing countries. Other disease states that increase the risk of developing tuberculosis are Hodgkin lymphoma, end-stage renal disease, chronic lung disease, malnutrition, and alcoholism. Diet may also modulate risk. For example, among immigrants in London from the Indian subcontinent, vegetarian Hindu Asians were found to have an 8.5 fold increased risk of tuberculosis, compared to Muslims who ate meat and fish daily. Although a causal link is not proved by this data, this increased risk could be caused by micronutrient deficiencies: possibly iron, vitamin B12 or vitamin D. Further studies have provided more evidence of a link between vitamin D deficiency and an increased risk of contracting tuberculosis. Globally, the severe malnutrition common in parts of the developing world causes a large increase in the risk of developing active tuberculosis, due to its damaging effects on the immune system. Along with overcrowding, poor nutrition may contribute to the strong link observed between tuberculosis and poverty. Prisoners, especially in poor countries, are particularly vulnerable to infectious diseases such as HIV/AIDS and TB. Prisons provide conditions that allow TB to spread rapidly, due to overcrowding, poor nutrition and a lack of health services. Since the early 1990s, TB outbreaks have been reported in prisons in many countries in Eastern Europe. The prevalence of TB in prisons is much higher than among the general population, in some countries as much as 40 times higher. Heinrich Hermann Robert Koch was born in Clausthal, Prussia one of the German states as the son of a mining official. He studied medicine under Friedrich Gustav Jakob Henle at the University of Göttingen and graduated in 1866. He then served in the Franco-Prussian War and later became district medical officer, Wollstein (Wolsztyn), Prussian Poland. Working with very limited resources, he became one of the founders of bacteriology, the other major figure being Louis Pasteur. After Casimir Davaine showed the direct transmission of the anthrax bacillus between cows, Koch studied anthrax more closely. He invented methods to purify the bacillus from blood samples and grow pure cultures. He found that, while it could not survive outside a host for long, anthrax built persisting endospores that could last a long time. These endospores, embedded in soil, were the cause of unexplained “spontaneous” outbreaks of anthrax. Koch published his findings in 1876, and was rewarded with a job at the Imperial Health Office in Berlin in 1880. In 1881, he urged the sterilization of surgical instruments using heat. In Berlin, he improved the methods he used in Wollstein, including staining and purification techniques, and bacterial growth media, including agar plates (thanks to the advice of Angelina and Walther Hesse) and the Petri dish, named after its inventor, his assistant Julius Richard Petri and these devices are still used today. With these techniques, he was able to discover the bacterium causing tuberculosis (Mycobacterium tuberculosis) in 1882 (he announced the discovery on 24 March). Tuberculosis was the cause of one in seven deaths in the mid-19th century. Retrievable from an inoculated animal and cultured again. Koch’s pupils found the organisms responsible for diphtheria, typhoid, pneumonia, gonorrhoea, cerebrospinal meningitis, leprosy, bubonic plague, tetanus, and syphilis, among others, by using his methods. 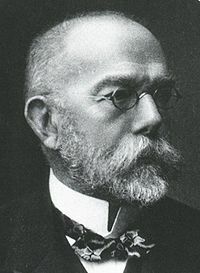 Robert Koch died on 27 May 1910 from a heart-attack in Baden-Baden, aged 66.